For the past two months, I have been on a tear to use up some of my off cuts. 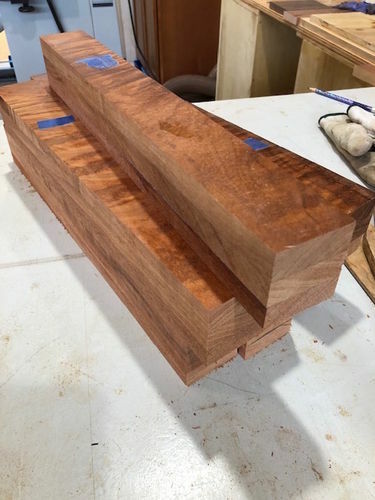 Of course, you always think you will use this wood up immediately and before you know it, they have taken over every inch of storage in your shop. So I made 17 segmented lamps. Did this use up all my extra wood, no way! At least, I did use some and got some nice lamps in the process. I do not have the entire process in photos, but I did a video tutorial on my cathyswoodworking FB page. Basically, it is absolutely imperative to have all pieces for these lamps dimensioned precisely or the revealed layers will not be symmetrical. For all of these lamps, I made octagons. I used different species of wood to get some color contrast and control the cost as much as possible. I found a lamp with a rough width of up to 2.5 inches for the top layer gave me good results. Most lamps had 5-6 layers, each layer was about .4 to .7 inches in thickness. After the layers were sized and sanded for consistency, they were glued together. Once they came out of the clamps, I cut the sides at 22.5 degrees to create the octagon, with the use a simple jig on the table saw. I made sure to mark the faces for the best match of the lamp before gluing the lamp body together. After the lamps body was glued up, I cut the joint on the saw, again at 22.5 degrees for my inlay, which is at least half the depth of the original joint and insert the inlay. The lamp was then ready for turning on the lathe. I turned a tenon on each end, making sure the lamp was centered. Then added a cap piece and the base, which are mortised for the tenon. The results are always interesting and as unique as you please. Ok….. WOW!!!! That is some beautiful wood, and a real nice combination to show the beauty of the wood grain of each variety. Very well done Cathy. Beautiful Lamp bodies, fine workmanship congratulations on a job well done. Outstanding. Wish I had scraps like that to play around with. Yup, paid dearly for scraps like that last trip there, do like the lamps and idea to use excess material in the shop. Beautiful work, I do not know how I missed seeing your projects, I do not want to miss any more. Love Koa, so hard to get here in Fla. Nice work on the lamps. I think Mama’s fish house is make entirely of Koa, or at least the inside. I was awed. Food awesome too! Beautiful work and wish I could replace my crap scrap bin with yours!! Thanks for your support. Koa is a pretty wood, but it is expensive and tricky to work. My favorite wood is narra, we have a few trees here in Hawaii. It is a joy to work. 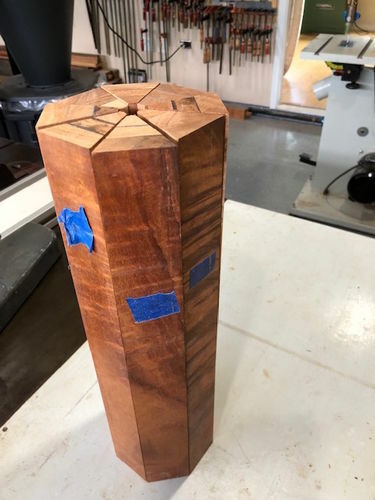 I added the two walnut lamps to make a case in Hawaii that koa is not the only pretty wood in the world. One major problem with koa is the variability in color, density, and figure within the wood from the same tree. This is how you end up with so many off cuts, nothing matches….it can be frustrating. So never fret about not using koa, there are so many other woods which are just beautiful. Wow. Some very nice looking lamps. Thank you for the support. I have been polishing these lamps with my micro mesh paper up to 3600 grit. They are super smooth, then paste wax. I am using three-way switches on most of them. Getting good lamps shades is hard and expensive in Hawaii. The shipping costs are killing me! You can’t put a cheap lamp shade on a custom lamp. I’ll post some photos as soon as some shades arrive. Keep making saw dust out there. Someday, none of us will be able to create our work again. 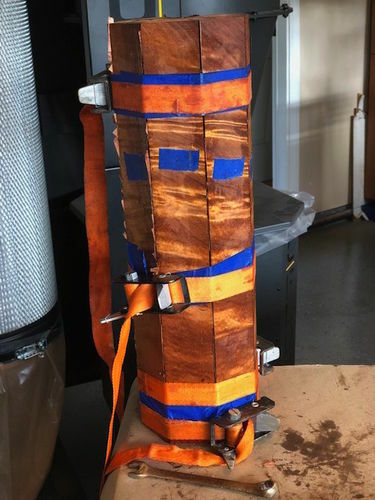 Hopefully, we will inspire others to pick up our tools and our love for woodworking.